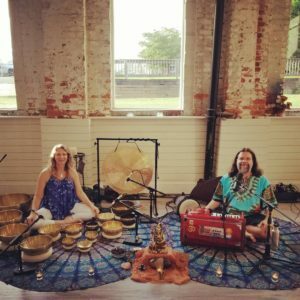 Join our guests, Cosmic Sound Mandala, from 7:00 – 9:00 pm on Saturday, Oct 27th, for a deep immersion in the ocean of Goddess energy! This meditation focuses on the root mantras for three of the most accessible manifestations of Divine Mother: Durga, the goddess of courage and victory, Lakshmi, the goddess of abundance and fertility, and Sarasvati, the goddess of knowledge and creativity. These three goddesses, often depicted together in Indian sacred art, form a gateway into the infinite energy of the Great Goddess, which is the essence of everything we perceive as reality. Connecting with these three goddess manifestations can help to promote growth and evolution in a myriad of different ways, and is equally beneficial for both women and men.